Each summer Washington, DC plays host to throngs of tourists clambering to see our nation's gleaming marbled monuments and world class museums. Perhaps even your family is planning a trip? Perfect! Your cover is set. They'll never suspect a thing. 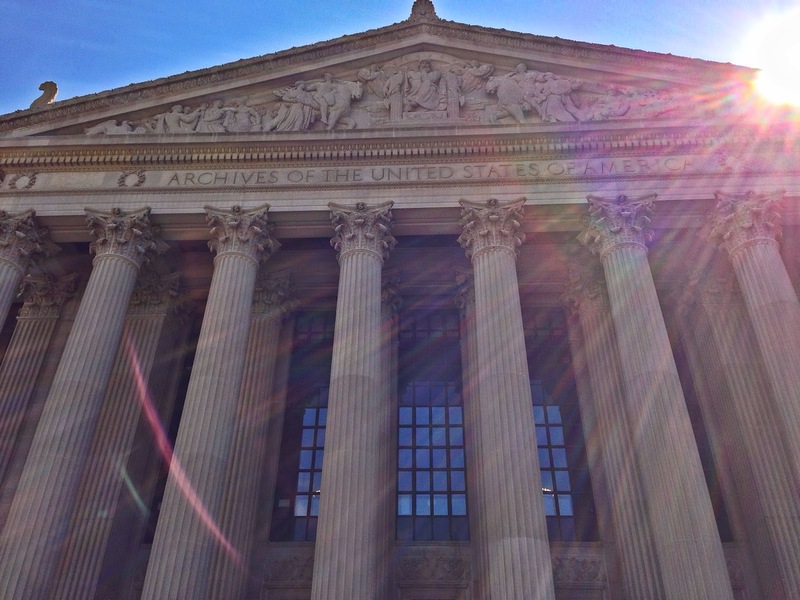 There's plenty of America's revered history and stoic patriotism on display to keep them occupied while you quietly slip away to indulge your inner genealogist. 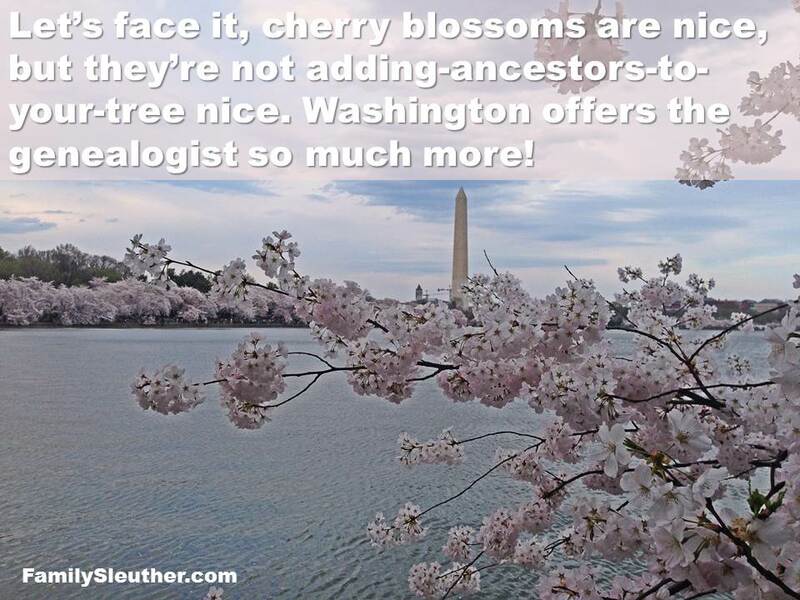 Let's face it, cherry blossoms are nice, but they're not adding-ancestors-to-the-family-tree nice. 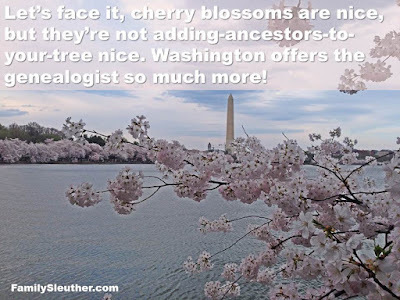 Washington offers the genealogist so much more! 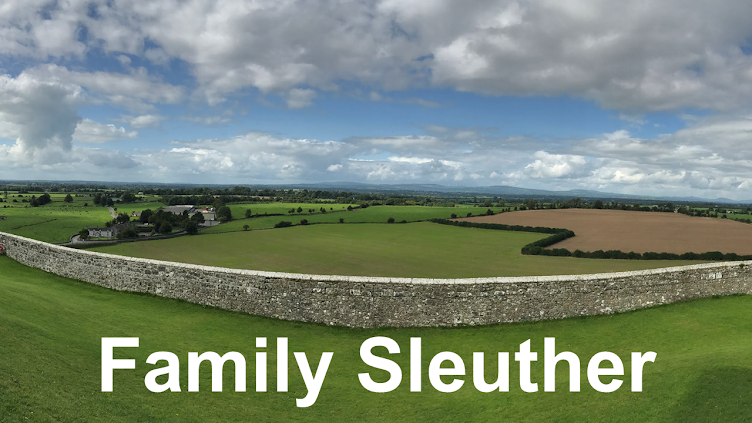 Having lived in the capital city for over 12 years, I can assure you that there are some very renowned and quite accessible research facilities certain to make a family historian's heart flutter and reveal a branch or two on the family tree. Here are Washington's top 3 sites that every genealogist must cross off their bucket list. The National Archives building occupies prime real estate midway between the White House and the Capitol Building. Here's the important trick: send your family inside the museum entrance on Constitution Avenue. They'll be so enthralled viewing the original hand signed copies of the Declaration of Independence and Constitution that they won't even notice when you tiptoe away to the quieter Pennsylvania Avenue entrance reserved for researchers (ahem, that's you!). Inside, you'll quickly register for a research card (it's free) and can chat with knowledgeable archivists who are able to pinpoint records that may help you solve a family mystery. Perhaps you have a Civil War veteran among your ancestors? If he had a pension (or just applied for a pension) he may have a file that you can request and thumb through. I mean the original stinkin' file in your hand, eyeballing great-grandpappy's handwriting in ink, perhaps detailing his accounts of bloody battle and war wounds while conveniently namedropping his lineage. I've had very exciting experiences in the Archives. For example, I learned that two 3rd great-grandfathers both enlisted in the Union Army. I was prepared to read harrowing details of the battles they fought and won. Instead, I learned that disease was the leading cause of death for enlisted men (see Disease in the Civil War). In another case, I learned that my ancestors were Union sympathizers who had to make a hasty retreat from their home in Virginia when the Confederates invaded (see Running From the Rebels). In the haphazard retreat, the family Bible was lost in the Ohio River (say it ain't so!). Which of your family's stories are held safe in the Archives? First things first: this is Washington's most beautiful building. You have to wander inside its great hall and marvel at its ornate interiors. It's an ode to humankind's written legacy. You can even see an original copy of the Gutenberg Bible! Today it's billed as the world's largest library. It wasn't always. Much of the initial collection was destroyed when the British marched on Washington and torched everything in sight. Thomas Jefferson offered his personal library to re-establish the collection and position it for its current grandiose state. For the genealogist, you'll want to pick up a researcher card (again, free) and - like a VIP - bypass the hordes of tourists (your family can occupy themselves in the many exhibit spaces) and step into the members only Main Reading Room. It's otherworldly and certain to inspire your genealogical research. The Library offers an array of digitized treasures like its large collection of public domain images, including many of Civil War soldiers (not all in the public domain). Its crown jewel, though, may be the Chronicling America project, which features digitized American newspapers spanning 1836 to 1922. It's an ever growing collection with new papers added each year. 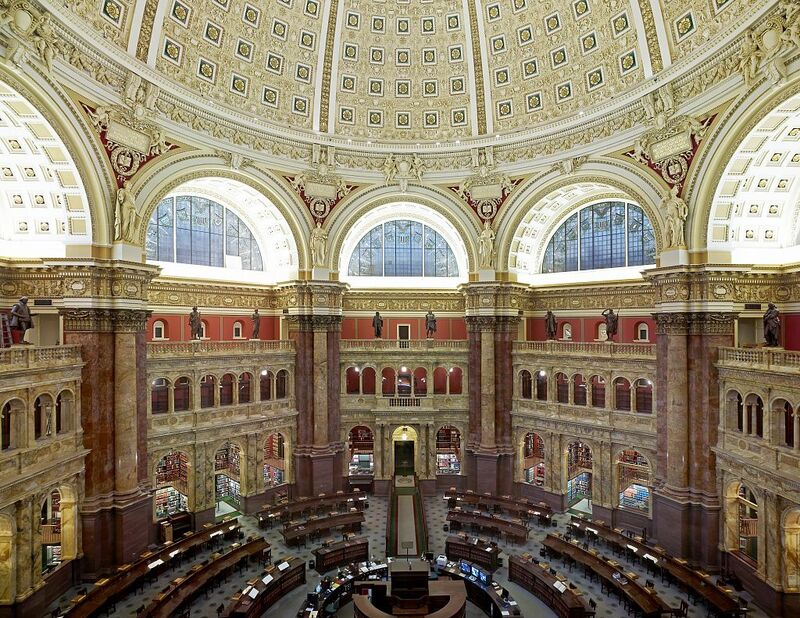 But you don't come to the Library of Congress to take advantage of their online features. You're here because there are thousands of published family histories in the stacks. I pulled a volume that documented the genealogy of my 7th great-grandfather Erasmus Rosenberger who was born in what is now Germany and emigrated to the New World in the mid-1700s. The hefty volume - long out of print and only available to me because of the Library of Congress' expansive collection - detailed thousands of his descendants, including my own great-grandmother who had corresponded with the author decades ago. It's really something special to read your great-grandmother's name in a book in the glorious Main Reading Room. The national headquarters for the Daughters of the American Revolution (DAR) is just a short walk away from the White House. Leave your family gawking at 1600 Pennsylvania and then make a run for it! DAR headquarters include a large library that is open (free!) to researchers. No membership card is required. Simply sign yourself in, collect a visitor's badge and be on your way. The book stacks are organized by state and then county. Volumes include county histories, published vital records registrations, biographies, and countless other works that aid your genealogy. DAR's library is a fantastic resource because it includes publications from genealogical societies across the country, and many dating back decades. I spent time reviewing published burial indices from Lawrence County, Ohio during a search for my 4th great-grandfather's grave. Although I wasn't successful, I knew I had personally reviewed the same resources on the shelves of the Lawrence County Genealogical Society. There's something gratifying about knowing that you have reviewed the source materials instead of relying on a third party researcher. These three locations offer the greatest value to the broadest group of researchers. But it's a big city and there are a handful of smaller collections at other repositories, many of them quite niche and tailored to specific research interests. What did I miss? What should be a part of this list?